To add a bit of colour, I thought this time I would mention in passing the hotels where I stayed. So, to the first one, in a small village perched high above and to the west of Dijon, with a panoramic view across the city. It was also the village inn. It was very cheap, very clean and perfectly comfortable. The supper was nothing special, but entirely edible, and considering it cost 65 francs (for four courses and half a bottle of wine), who's complaining? There was only one small drawback: the church, or rather its bell. It clearly had a mission to announce the time every half hour to the whole of Dijon - one of those bells that after each clang leaves an intense, actually quite musical, reverberation. For some reason every hour it struck the hour twice. I was tired that evening and went to bed straight after supper. In fact, I was so tired I couldn't quite get to sleep. Ten o'clock was twenty clangs. I was dreading midnight. I heard every one of the twenty-four clangs. Then I fell asleep - I never heard one o'clock. Another break with previous years: to make the thing more digestible I will only deal with a selection of the growers from whom I bought this time. Domaine THEVENOT-LE BRUN (Marey les Fussey). I arrive here at 9 o'clock. M.Thevenot is extremely friendly, much more friendly than last year. We taste some whites in the tasting room. Then we were off into the cellars (more like a large clean agricultural building, in fact, with upright tanks for the wine 25 ft high). Here we tasted wines from tank and from cask, not yet bottled. These were the 98s - a theoretically difficult vintage, but all the growers I visited seem to have made perfectly good wines, with excellent colours in the reds and nicely concentrated flavours. At this domaine the whites were particularly impressive. I was running short of time. Last year, my visit had been over rather quickly, so I had only allotted one hour this time. It was not enough. M.Thevenot let me telephone to the next domaine to say I would be late. Then back to the tasting room to try some bottles of red. The Bourgogne Hautes CÃ´tes de Nuits 1996 especially struck me with its combination of fresh strawberry fruitiness and vinosity. M.Thevenot thought it might be nice to round off my visit with a quick tour of his vineyards, so we made for his Citroen van (just like mine). We got in. No keys. He got out and went to look for them. No luck, so we we went in my van instead. The vines were all immaculately kept. They definitely have their priorities right, namely to produce the highest quality fruit with which to make their wine. Domaine BERNARD AMIOT (Chambolle-Musigny). After lunch I visited M.Amiot, where they were rather taken up with a courtier, who was tasting through the domaine's wines, so I had to wait a minute while they dealt with him. A courtier is an intermediary between the grower and the large merchants in Beaune and Nuits St. Georges - an important person in the life of many small growers in Burgundy. As usual, the tasting here was quite brisk, but an interesting and encouraging development at this domaine is that one of the Amiot fils was about, and making efforts to be friendly to me, suggesting that maybe the question of succession (which had not looked promising a couple of years ago when I first visited) is resolving itself. He is a delightful young fellow, and if he is also a competent wine maker, then the future looks exciting. Domaine PHILIPPE GAVIGNET (Nuits Saint Georges). Next stop Nuits Saint Georges, where M.Gavignet seemed a bit surly. His moods seem very uneven. Nevertheless, he gave me a comprehensive tasting, both in bottle and cask. 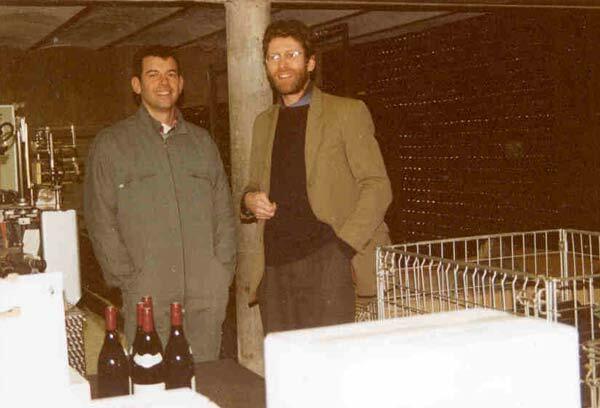 His Bourgogne Hautes CÃ´tes de Nuits "Clos des Dames Huguettes" 1998 (still in cask) particularly impressed me. He told me that before the malolactic fermentation (which takes place any time between Christmas following the harvest and July or later) his wines were extremely tannic, but that after the "malo", the wines softened dramatically -in fact, he had never seen such a big change in any vintage before. Monday night I spent in a hotel on the edge of Savigny-les-Beaune, where I was the only guest. It seemed quite comfortable. However, I like to wash/shower in the morning. The water had been piping hot at night, but Tuesday morning it was freezing cold. So I'm not going back there again. Domaine POULLEAU (Volnay). Tuesday after lunch I visited Thierry Poulleau, a young vigneron who took over from his father fairly recently, and I think is showing lots of promise: his wines have a vivid fruitiness that is really appealing. He was in fine form for the tasting. 1997 was a rather uneven vintage for reds in Burgundy, but he has made a great success of it. His CÃ´te de Beaune "Les Mondes Rondes" is especially impressive. After he came out of the army, as a young vigneron he was allowed under a government scheme to clear uncultivated land and plant vines (I think at the rate of 1 hectare per year). He now has a 3.5 ha parcel in this vineyard, and the 97 is significantly better than the 95, suggesting that as the vines gain in maturity the quality of the wine is improving. It offers a brilliant rapport between quality and price. Domaine DIDIER MONTCHOVET (Nantoux). I arrived here late, but my welcome was surprisingly warm. This is a domaine that is not only organic, it is run biodynamically. Like Thierry Poulleau, the Montchovets have cleared land to plant vines. Thus they have set up their domaine. We tasted through their range, and they also gave me a taste of an older vintage of their white Bourgogne Hautes CÃ´tes de Beaune - 1994, not wonderful for whites - but this had a smell of mature Meursault, and was deliciously fresh tasting. 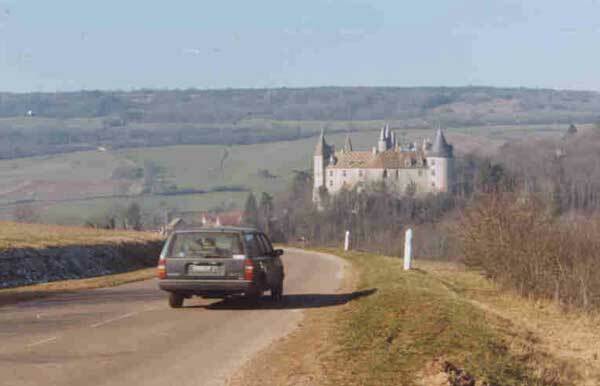 Tuesday night I stayed in Couches, a small town south-west of Santenay where there is a wonderful turreted castle perched above a steep river valley. The atmosphere of the hotel was positively gothic. Like Anthony Perkins in Psycho the proprietor was waiting at the door, looking out as I approached uphill. He let me in sepulchrally. Imagine a tombstone walking around. That was the proprietor. I was the only guest, and diner. There was a very young waitress who was so unwell she should have been in bed. She had jet black hair done in a pony-tail, and jet black eye make-up. She sniffled and snuffled and looked as if she might fall over, so I suggested she might like to sit down, because I didn't mind. She replied miserably that "la service" required her to stand up. The orders for the service of each course had to be formally relayed to the kitchen by means of a series of commands passed from the waitress to the proprietor to the kitchen before being formally served at the table. I'm not staying there again. Domaine CLAUDE NOUVEAU (Marchezeuil-Change). A hard-working, conscientious grower, whose wines are always clean and carefully made with well-defined fruit. We start with his white 1997s, which are perfumed, fat and delicious. On to his reds: I have arranged to buy his two Santenays, which both have a really good smell and excellent length. 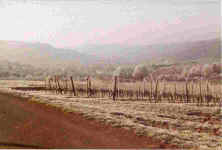 Domaine MICHEL SERVEAU (La Rochepot). M.Serveau tells me that he finds it much easier to sell his reds than his whites, which suits me fine, because his whites in my opinion are outstanding -in fact his Chassagne-Montrachet is a masterpiece: not fat and rich, but with wonderful finesse and a flavour of extraordinary beauty. Domaine JEAN et GENO MUSSO (Dracy-les-Couches). A new discovery. Certainly the most unpromising domaine I have been to in all my visits to Burgundy. First problem: the Mussos are rather difficult to get hold of. They have a manager, a charming young man called Alain, who can barely write (it was a big struggle for him to write out my bill). Second: the place is almost impossible to find. Dracy-les-Couches is nowhere. The region of the Couchois is quietly tucked away off the beaten Burgundy track. Unlike all the other parts of Burgundy I visit, where there are signs everywhere directing you to the domaines, here there is not a single sign. The village sits in the bottom of a valley, only visible once you get quite close to it. There is one bar (empty). And a really pretty chÃ¢teau, with vineyards behind and what looked to me like seriously extensive arrangements for storing wine. It turns out this chÃ¢teau is owned by the managing director of one of the large negociant houses in Beaune. The village was deserted. I couldn't find the domaine. I asked in the bar, and eventually found it: a collection of entirely agricultural-looking farm buildings. Was this really the right place? And then Alain popped out like a pixie from one of the barns and invited me to go and taste. I hadn't seen anything that looked remotely like a cellar yet. I conversationally mentioned that it had been quite difficult to find the domaine - didn't Alain think it might help to put up signs? No, he replied, if they put up signs they'd be overrun by visitors! If this domaine has cellars I never saw them. The wines - bottled, in cask and in tank - are secreted in various unlikely looking farm buildings around the village. We started with the AligotÃ©. I was not hopeful. We were in one of those sections of a barn where you might keep a calf that has lost its mother. It was a small space - enough for the half-dozen old oak casks being stored there. Underfoot was a dirt floor. Alain took out his pipette and put a shot of wine into each of our glasses. It was delicious: full, with vivid AligotÃ© flavour, clean(!) - amazing. Then across the lane, past some dead, decaying old barrels and into the main section of another barn through large doors twelve foot high. Inside there is an enormous metal tank, and an assortment of smaller plastic and resin tanks, including one shaped like a sausage, on wheels. There is hay and straw everywhere. Above the huge metal tank hay is stored. All the wines in here are 1998 reds. What are they going to be like? Was the AligotÃ© just a freak? The wines are thrilling, brilliant: fresh, vivid, exuberant, clean(again!) Pinot Noir flavours; the fruit is really pure, clear, well-defined. This is the kind of Burgundy that makes me want to shout "Eureka". Alain tells me a bit about the winemaking. I happen to know the domaine is an organic producer. He talks about their attitude to chaptalisation: minimal - none if at all possible. I'm sure this in part explains why the wines have such true, well-defined flavour. I haven't been taking notes -it all seemed so unpromising. Things were looking exciting now - so exciting I forgot to start taking notes. I have no notes of my visit here. The wines in this barn are waiting to finish their malolactic fermentation before being transferred to oak casks (only old barrels, no new oak here!). The next surprise: Alain took me off to another section of the original barn where the 1997 reds were still maturing in cask. Everybody else had bottled their 97 reds. The received thinking among most winemakers is that too long in cask dries a wine out and strips it of fruit. We start tasting: all these wines are as fresh, clean and scrummy as you could possibly hope for. How do they do it? It is a mystery. Parenthetically, I will just say that when I went back the next day, Alain took me to yet another part of the village, where cases of wine, some open, some missing bottles, were chaotically, anarchically scattered about a hay barn. This, presumably, is a bottle store. It is my last visit of the day, and tonight's hotel is a long drive away. The taste of these remarkable wines stays with me throughout the drive. I've tasted nothing in bottle, but I decide I have to risk buying some. Domaine GACHOT-MONOT (Gerland). Damien Gachot is my favourite winemaker. He is young, enthusiastic, quirky and funny. He is visibly gaining in confidence. This time the excitement for me is that he is releasing two new wines. Damien is excited about something too. He shows me the neck of a bottle with no capsule. I don't know what exactly he is showing me, but I say how nice it looks. He draws the cork, and says, "Look, the cork" proudly, and holds it up to me between his thumb and forefinger. "It is like les grands domaines!" And so it is. His new wines have corks specially printed with the domaine's emblem, "G-M", the name of the vineyard and the vintage. He is so pleased. Off we go tasting. His wines are as delicious and exciting as ever. One of the new wines is completely new, while the other is a special bottling of a 2 ha parcel of vines, "Les Chaillots", within his CÃ´te de Nuits Villages holdings, which always produces superior wine, with more weight and concentration. Damien is excited about something else too. As we taste he tells me about a write-up he is going to get in a specialist wine magazine, Bourgogne Aujourd'hui. This is for his Nuits St. Georges 1er Cru, of which he only makes one cask (300 bottles). It was entered alongside bottles from the great and good producers of Nuits St. Georges with absolutely acres of 1er Cru vines - 10, 15 acres. The magazine only writes up a select few of the entrants. They rang to say they'd like to include Gachot-Monot. A journalist was sent to interview Damien, and started by asking him what acreage he had of his 1er Cru vines. Damien said 0.06 of a hectare (about one seventh of an acre). The journalist, apparently, nearly fell off his chair. 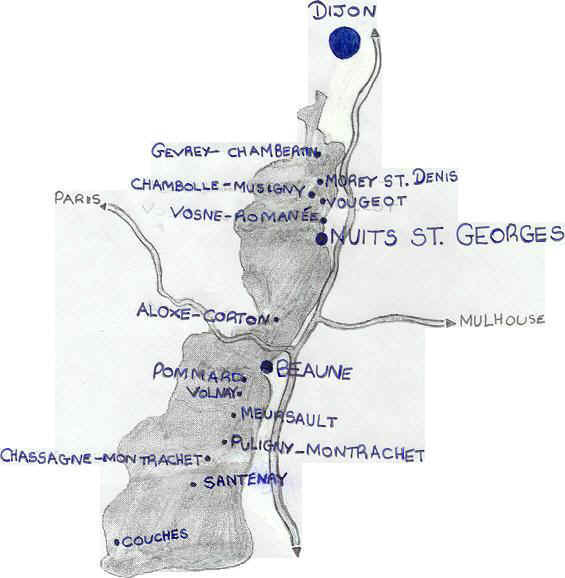 The other new wine, the completely new one, is a Nuits St. Georges "Les Crots" - vines he has recently bought - next to LupÃ©-Cholet's ChÃ¢teau Gris, and, though only a village appellation, is very well-sited. The 1997 is forward, soft, sweet and delicious, with beautiful balance. Thursday night I spent in Mirebeau-sur-BÃ¨ze, north-east of Dijon. After the last three hotels I was not expecting much. It turned out to be wonderful. It was run with an efficiency that was not at all impersonal. Madame, who was in charge, was polite and friendly. The cooking was excellent. I had a really good night's sleep, and set off back home the next morning in extra good spirits.